A Spontaneous Trip Down Memory Lane ~ The Toronto Hare Krishna Temple! 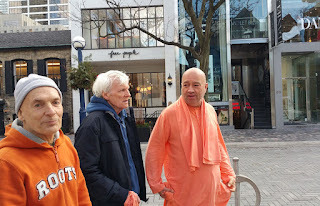 With the unusually warm (but awesome) weather that we had in Toronto yesterday, Bhaktimarga Swami decided to head out for a spontaneous walk in the afternoon with his two visiting godbrothers: Drupada das and Garuda Vahan das - devotees who were two of the many early pioneers of our Toronto Hare Krishna community. The walk was a "trip down memory lane" of sorts as the chosen route was through the trendy Yorkville neighbourhood. While Yorkville is now known for being a swanky, upscale neighbourhood with expensive boutiques, restaurants and shops, it was a very different mood in the 1960s. As explained by the three senior devotees on their walk, "Yorkville was the hippy enclave of Toronto and probably even the hippy capital of Canada in the 1960s!". As each street was explored, Bhaktimarga Swami, Drupada das and Garuda Vahan das, would often pause at various buildings and talk about the incredible history of the neighbourhood and how devotees would often do sankirtan there! The trip ended with a visit to one of the buildings just south of the temple, on Avenue Road, which used to house the Govinda's restaurant! Drupada prabhu remarked, "You could get a full vegetarian thali for $2 or $3! ".